This fungus develops on dead pine trees whose bark has fallen away. It is shiny, bright yellow-orange, lobed and convoluted, with an appearance somewhat like the surface of the brain (a gelatinous mass) once fully developed. It typically appears after a heavy rain fall. Witch’s butter has tuning-fork shaped basidia and multi-septate, curved-oblong spores that appear on the upper surface. Fruiting bodies are (typically) 1 to 6 cm x 2.5 cm and they form dense clusters. They have a white basal attachment. It dries to a reddish-orange or dark red-brown colour, with a tough outer membrane. 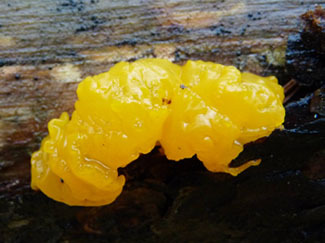 Although Tremella mesenterica is a bit similar, they are more yellow in colour, and they fruit only on hardwood trees which still have their bark. Tremella mesenterica is also known as Witch’s butter. Both these forms of Witch’s butter are edible ONLY when they are boiled or steamed. Witch’s butter appears from May through November throughout most of North America, Europe, Northern Africa and parts of Asia. 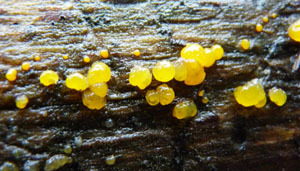 Dacrymyces palmatus is saprobic; this means that it lives off of dead or decaying plant material. This is why you will find it only on fallen pine trees where there is no outer bark. Most members of the Basidiomycota phylum (jelly fungi), are edible. They have no smell to them and they are flavourless. They add a distinctive texture to many culinary dishes (soups mostly). According to Wise Geek, it is reported in China that jelly fungi are thought to improve circulation and breathing. In addition, chemicals found in certain species of the Basidiomycota phylum are thought to have a blood thinning effect. According to Eastern European legend, when Witch’s butter appears on the gate or door of one’s home that home (and the family) had been targeted by the spell of a witch. The only remedy to remove the evil spell was to pierce the jelly fungus with something sharp until it died. People are poisoned every year by eating wild mushrooms, often from eating a poisonous species that resembles an edible species. Although deaths are rare, there is no cure short of a liver transplant for severe poisoning! Do not eat any mushroom unless you are absolutely certain of its identity! Do not trust my identification of Witch’s butter – be sure to cross reference my information with minimum two, preferably three other credible sources. I am not a mushroom expert – I am only relaying information according to what I have researched. This is great info and I triple checked it. Guess what was in my soup today!! Added nutrition! found these on a walk in the woods today. Thanks for the info. What about if it’s very dark brown, almost black. Is it still the same species and is it edible? I found something just like this but darker in color. Can I ask you… We found a bunch of the off white jelly fungus or pale jelly roll…Ductifera pululahuana. Do you know whether or not these are edible ? We’ve eaten the red and black jelly fungus and really love them. https://en.wikipedia.org/wiki/Exidia_glandulosa this is what I believe you have found. Check out jelly roll fungus (Exidia glandulosa), known also as black witch’s butter. Found Witches’ Fungi today 2-8-2018 after 2 rainy days in Sam Houston National Forest. Same here. Spotted them 4-25-18. My neighbor knew I was a photographer and thought I’d like to see these “strange orange blossoms” growing on the evergreens surrounding the apartment. They were on every tree, and we could see them on limbs way up on top of the trees. “I don’t think those are blossoms,” I told her. Anyway, she contacted her son-in-law who works with the Forest Service. Long story short – we were not being invaded by alien beings, but it doesn’t look good for our trees. We spotted them at work, in the North Cascades national Forest! In Newhalem, Wa.I was with 2 NPS Rangers, and a mushroom hunter! I found some that was bright orange in cracks on an old lilac tree branch. Thanks for the info!! My friends yard has an abundance of pines and this orange jelly is taking over!!! Some branches are completely smothered and it even sprouts on her wood made deck. Every time it rains they pop up like crazy! Glad to hear they are edible! (Not that I will be munching on them anytime soon) it comes off real easy, just shake a branch and it rains orange jelly!! !